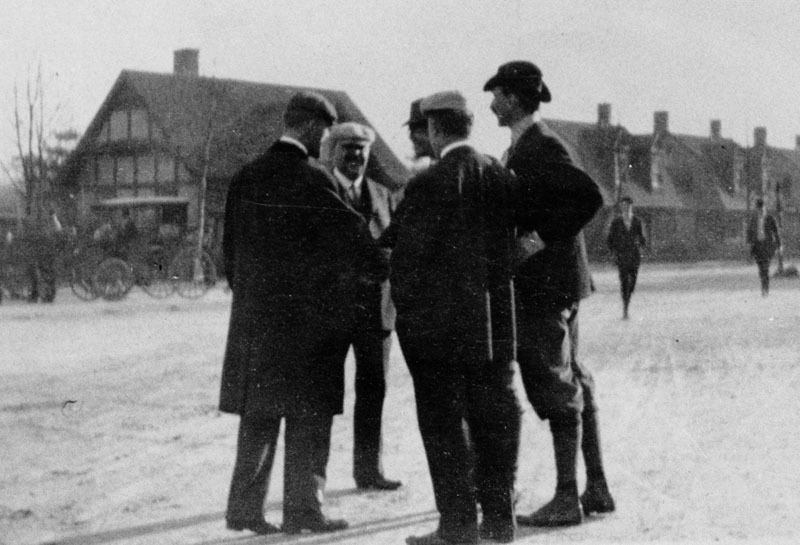 One hundred years ago today, Dr. Carl Schenck, resident forester at George W. Vanderbilt’s Biltmore Estate and founder of the Biltmore Forest School, opened a three-day forestry fair on the Biltmore grounds. At a time when forestry work in America was still very much in its infancy, this unique fair was designed by Schenck to demonstrate to visitors the accomplishments and possibilities of scientific management and practical forestry techniques. Schenck’s forest festival also celebrated the 20th anniversary of forest management on the Biltmore estate and the 10th anniversary of the Biltmore Forest School. 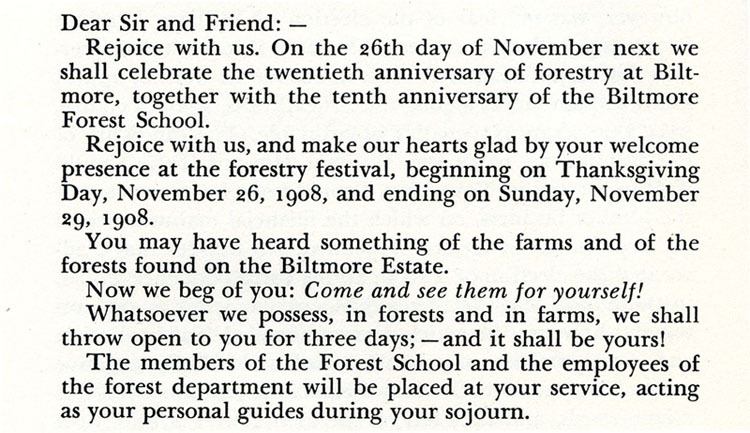 Schenck sent personal letters inviting close to 400 people to the fair, including several senators, governors, and the newly elected president of the U.S., William Howard Taft (for a full look at the text from the invitations, which also included a program of planned events, see this excerpt from Cradle of Forestry in America: The Biltmore Forest School, 1898-1913). Along with these letters of invitation, Schenck also mailed to each proposed guest a 55-page illustrated booklet, A Forest Fair in the Biltmore Forest, which served as both a guide to the forests at Biltmore as well as a textbook of forestry and conservation practices. And although no presidents, senators, or governors made an appearance, some 50 to 100 guests, including foresters, lumbermen, furniture manufacturers, botanists, university professors, and more, took part in the events of the fair. 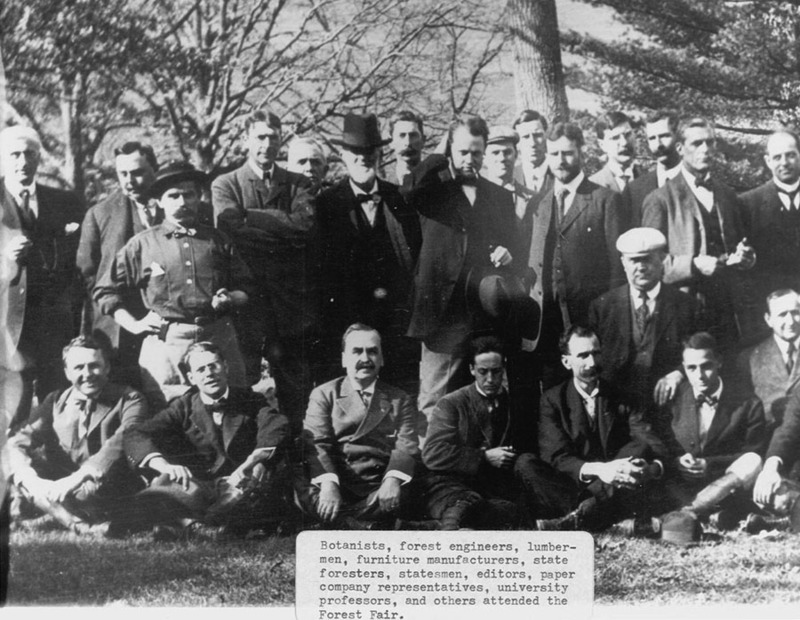 A group of Forest Fair attendees (from FHS Photo Collection). The fair’s program, as designed by Schenck, featured three days of activities. Visitors were given tours of the various forest plantations with Schenck as their educational guide, learning detailed lessons on forestry practices, planting techniques, logging operations, seed regeneration, soil composition, and more. The fairgoers were also treated to tours of the nationally-famous Biltmore Estate nurseries and herbarium, as well as events such as a Gala Dinner, a fishing and shooting contest, and a possum hunt and barbecue. The successful nature of the fair unfortunately proved to be the last high point of Schenck’s pioneering forestry work at Biltmore. The next year, 1909, saw his fallout with Vanderbilt and the end of the original Biltmore Forest School. Schenck’s many contributions to American forestry, though, have long outlived his time at Biltmore, and his legacy continues to be celebrated today at the Cradle of Forestry in America. For a look at the Fair through primary source materials, see the FHS Biltmore Forestry Fair Collection, which includes a series of full-text articles from American Lumberman (whose editor attended the fair). Also see the FHS Biltmore Forest School Images Collection which includes several photos taken at the Fair. To read the complete first-hand account of Schenck’s time at the Biltmore, see Cradle of Forestry in America: The Biltmore Forest School, 1898-1913.